First Place goes to Rebecca from Hugs are Fun! Rebecca submitted several space-themed entries (see them all here) and if I understand correctly, she is planning on stitching the whole alphabet! A fabulous theme that works very, very well in cross-stitch. We are looking forward to seeing more of Rebecca's work in the future. 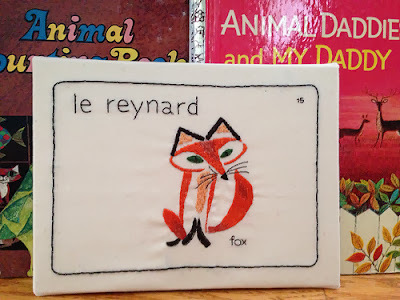 Rebecca, you will receive a copy of Mary Thomas' Embroidery Book, a calendar panel from SeptemberHouse, an ABC animal embroidery pattern from Penguin & Fish - plus a Book Love pattern and Sulky Iron On pen from Lucky Jackson! 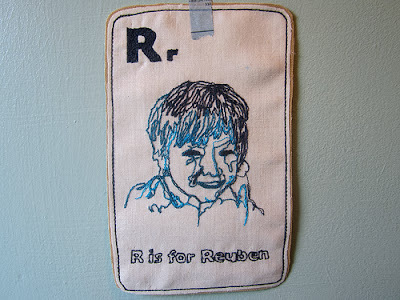 She machine-embroidered portraits of her children Reuben and Spike (here's Spike). We thought it was highly original and so well executed! Nora, you have won an ABC animal embroidery pattern from Penguin & Fish and a Book Love pattern plus Sulky Iron On pen from Lucky Jackson. Inspired by a vintage flash card, this sweet fox shows off some lovely fill stitching. Lucky Jackson's Book Love pattern is for you, Aimee! 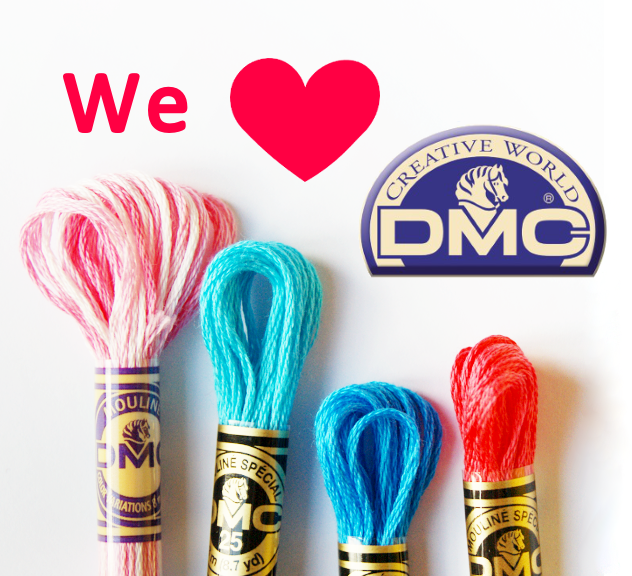 Please visit our Contest Gallery and perhaps leave a nice comment on the wonderful entered pieces. And many thanks to our sponsors - we appreciate your support immensely! thanks so much for hosting the contest and for the lovely comments! As soon as I saw Rebecca's work on Flickr I knew she would be the winner! I almost didn't enter because of that - lol! Congratulations to the winners! And thank you so much for having the contest, &Stitches! Yay! These are WONDERFUL! 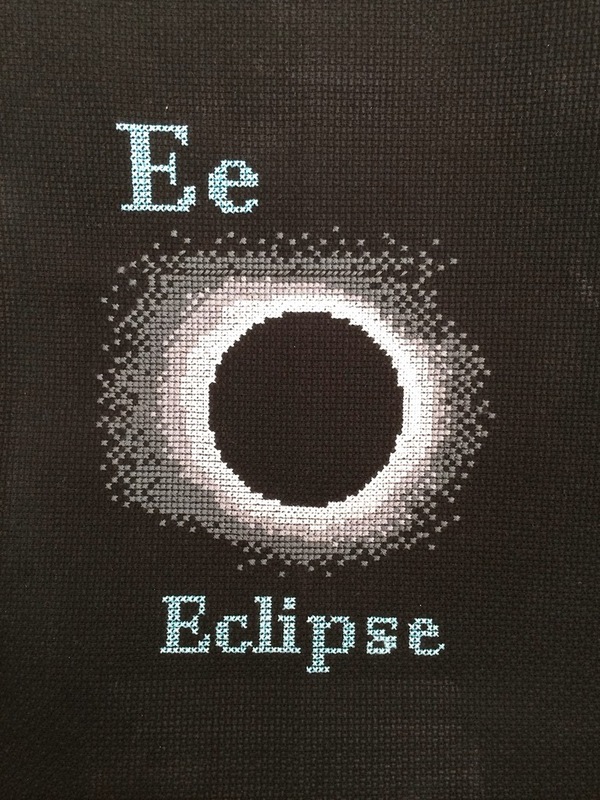 I especially love the eclipse card. Great job! How wonderful! Thank you for being such generous hosts. Rebecca's work is amazing, so pleased she won. So much fabulous work!!! Well done all!